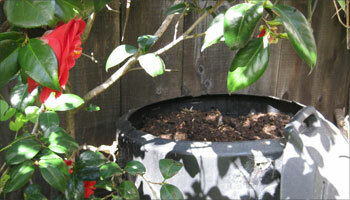 I have learned that what works for me is a series of containers for each step of the composting process. In my kitchen, I have a stainless steel bucket on the counter next to the sink. I’ve tried ceramic and plastic containers, but this seems to work the best and last longest. I empty this fairly frequently, at least once a day. Then I have one of those white plastic paint buckets with a tight fitting lid that I empty the kitchen compost into. This sits on my back porch, and gets pretty grotty. I like to put straw or clean sawdust in the bottom of this. Because of the laziness factor, this doesn’t get emptied until it’s completely full. 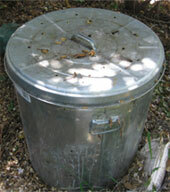 In the backyard, I have a large plastic composter and a couple of galvanized garbage cans, with holes hammered into them with a nail. At first I was composting directly into the plastic composter, but then I had a problem with rodents, and I really hate rodents. I rotate out the 2 metal cans, and when one is 3/4 full, I throw some straw on it, let it sit, and turn it, while using the other one for food scraps. When those are partially composted, I transfer them to the large plastic composter, which is bigger, so I can get higher temperatures. I don’t have a version where I sift the compost, because, by the time I want to use it, it’s looking pretty good. I do know other people who like to sift their compost. I have one more bin way in the back corner of my yard for big branches and things that will take forever to break down. I look at this about once a year. Hi Anne, I didn’t actually make the holes, my partner Dave did. From what I remember, he used a hammer and nails, is that what you’re using? It’s not completely perforated, and stays moister than the bigger compost that we transfer to when it’s well-rotted. It’s hard to get enough air in there, but once it’s sufficiently rotted, and the ants and fruit flies that can get in through the holes have had their way to speed decomposing, it’s ready for transfer, and the rodents don’t seem overly attracted to it. I can’t swear that they’re completely gone, but my plants aren’t getting eaten like they used to, and I haven’t seen one in a long time. Sneaky devils! I’ll try to get more details from Dave, probably next week.